And many other improvements and bug fixes. The complete release notes can be found HERE. Important note before trying to upgrade: these drivers will only work with GeForce 6 and above! The easiest way to upgrade to the latest nVidia 270.18 display drivers in Ubuntu (Maverick and Lucid) is to use the following PPA (just copy/paste the commands in a terminal). Before adding the PPA, please note that it currently holds nVidia 270.18 for Ubuntu 10.04 and 10.10 and nVidia 270.26 for Ubuntu 11.04! 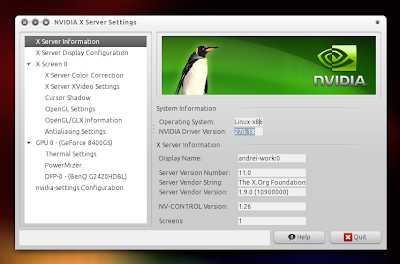 Then go to System > Administration > Hardware Drivers and make sure "Nvidia current" ("current" means latest so that would be 270.18 for Ubuntu 10.04 and 10.10 and 270.2 for Ubuntu 11.04) is activated. If for some reason the new drivers do not work properly, use PPA Purge to remove the PPA and revert all the changes. To find our if your graphics card is supported, go HERE and click on the SUPPORTED PRODUCTS tab.